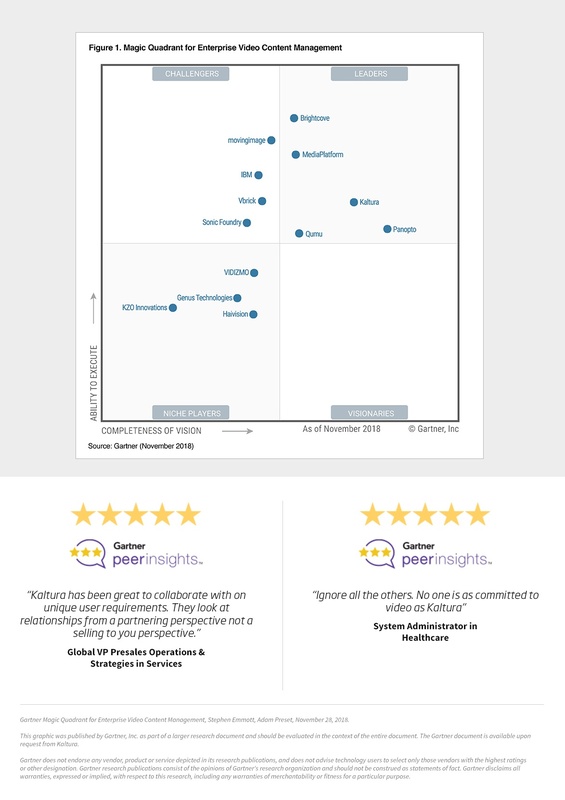 Kaltura is honored to be placed in the Leaders quadrant for the fifth consecutive report. We believe our position reflects Kaltura’s commitment to equally excelling in vision as in execution, reliably delivering tomorrow’s video technologies. With a unified video platform that supports live and VOD content, webcasting, rich media capture, Enterprise YouTube, eCDN, and out-of-the-box integrations with today’s enterprise platforms, Kaltura enables a single video strategy that delivers a high-quality video experience to any device. Get your complimentary copy of Gartner’s 2018 Magic Quadrant for Enterprise Video Content Management.